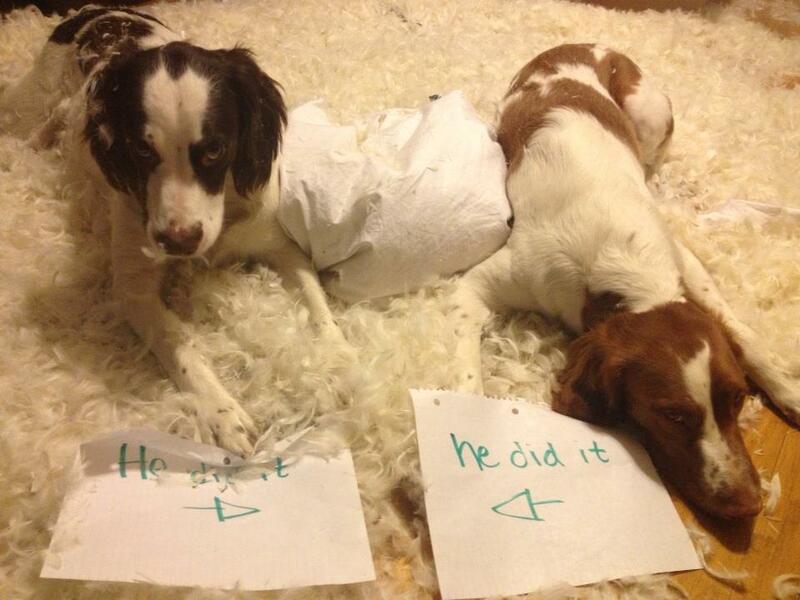 Which one looks more guilty? OMG! This happened to me when I was house sitting…and the ceiling fans were on….Took me 3 days to get all the feathers…and they were still finding them 3 weeks later! Oh my gosh I had to look twice cause I thought they were laying on a white carpet…… Oh tooooo funny!!! The pillow started it ! I love the fact that even after they did it, they lay there in the feathers, showing off their handiwork. Hey those are feathers, and they look like bird dogs to me. Just looking for the bird!! Yep, just doin what bird dogs are supposed to do!! Hunting those darn birds!!! The one on the left has a feather hanging outta his mouth. I’m sure the other one was just an innocent bystander . . . NOT!